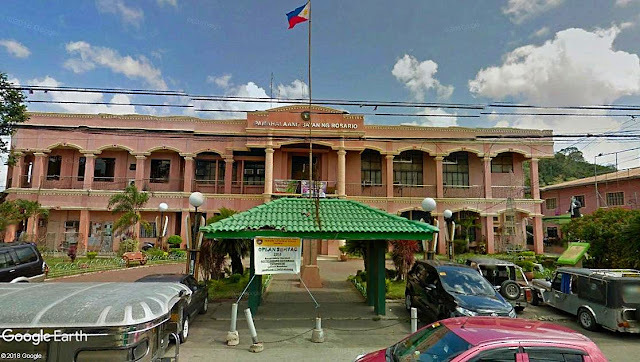 The Municipal Hall of Rosario, Batangas. Image source; Google Earth Street View. In the afternoon of 9 July 1954, one Gaudencio Manigbas1 gathered men in the house of a Catalino Ramos in barrio Macalamcam in Rosario, Batangas, to plot the assassination of the town’s then-Chief of Police Captain Esteban de Guzman. At the time, Manigbas was a “confidential agent” – i.e. informant or spy – assisting the Philippine Constabulary (PC) in its campaign against the Hukbalahap2. Manigbas was also a former Chief of Police of Rosario appointed to the position in September 1951 but was replaced in a quo warranto3 case just four months later by the town mayor4. Manigbas and de Guzman were affiliated with “irreconcilable political factions,” the former with one Isaac Farol, said to be the leader of an organized gang of kidnappers; and the latter with one “Arias,” already deceased5 [See notes and references.]. Manigbas laid the blame on the arrest and conviction of Farol, whom he called “boss,” on the Chief of Police. Although the assassination order was given by Manigbas, the actual ambush was carried out by a group of his men under the leadership of one Marcial Macalintal. The latter had earlier volunteered to be one of the “trigger men” along with one Lope de Torres and one Amado Ramos. The assassination accomplished, the ambush group returned to a school building in nearby Padre Garcia to report to Manigbas. The following day, as though nothing happened, Manigbas and his men went to the compound of the Philippine Constabulary in Rosario “to make a report.” The reader will recall that Manigbas was also a PC informant. Instead of being allowed to report, they were disarmed by the PC and their ammunitions taken. One Tomas Carandang, a member of Manigbas’ group, was detained by the PC for investigation “in connection with a kidnapping case and also for the killing of Esteban de Guzman.” Carandang would admit to having participated in the assassination of the Chief of Police and likewise implicate the other members of his group. Why Carandang was singled out for detention and investigation, the source documents failed to explain. However, because of his revelations, he would act as state witness and the other members of his group – including Manigbas – would be rounded up, investigated, and later charged for the murder of de Guzman and also for the assault and wounding of the Chief of Police’s companion Ilagan. The two cases would be jointly tried by the Court of First Instance of Batangas. Aside from Manigbas, also charged were Macalintal, de Torres, Ramos and Iluminado Landicho, Isabelo Egar, Alejandro Zuño, Ben Mercado, Melecio Sison, Eugenio Mendoza alias Eugenio Hernandez, Eliseo Carandang, Catalino Ramos, Modesto Leviste and Miguel Almario. Carandang was, of course, also charged, until the court agreed to drop the charges in exchange to his being a witness for the prosecution. This was apparently a celebrated case which was something of a “provincial sensation.” According to the one Rosario, Batangas-themed web site, all the accused would eventually be pardoned. This writer, however, is unable to find any documents over the Internet that would corroborate this. For readers who wish to know more about the details of this legal case, please click on the first link provided in the citation section below. 1 Most of the details of this article are taken from the Supreme Court decision “The People of the Philippines v Gaudencio Manigbas, et. al. 1960,” online at The LawPhil Project. 2 For the benefit of younger readers, the Hukbalahap was World War II guerilla group in the Philippines which became a communist insurgency group post-war. “Hukbalahap,” Wikipedia. 3 Quo warranto is “an extraordinary remedy by which a prosecuting attorney, who represents the public at large, challenges someone who has usurped a public office or someone who, through abuse or neglect, has forfeited an office to which s/he was entitled.” ‘Quo Warranto,’ online at The Free Legal Dictionary. 4 The town mayor mentioned was Jose E. Agoncillo according to “ Rosario of Batangas 1951-1989: Chapter VII Under The Third Philippine Republic,” online at Rosario, Batangas Information. 5 That “Arias” was likely mayor-elect Angel Arias, gunned down in December 1951 before he could assume office. Rosario, Batangas Information, ibid. 6 “Prision correccional,” according to the Revised Penal Code of the Philippines, is imprisonment “from six months and one day to six years.” “Revised Penal Code of the Philippines,” online at the Chan Robles Virtual Law Library. 7 “Prision mayor” is the “temporary absolute disqualification and that of perpetual special disqualification from the right of suffrage which the offender shall suffer although pardoned as to the principal penalty, unless the same shall have been expressly remitted in the pardon.” Revised Penal Code of the Philippines, ibid.